meaning Happy To Meet You ! "...reasonably priced, considering the quality of the fish and the skill that went into the preparations..."
"...watching a master sushi chef prepare an omakase meal is fascinating dinner theater and worth the price of admission." "For those who do not like sushi....There are plenty of cooked foods on the menu." "If you are one of those seek out real, authentic and traditional food, I highly recommend an excursion to Hajime. 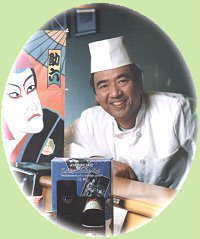 Chef Takahashi's omakase menu is nirvana for lovers of great Japanese food." " Hajime, a neat, compact dining spot and clearly one of the favorites in the Harrison neighborhood .... most diners are greeted by name. " 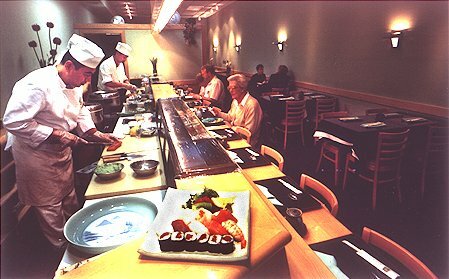 " a lovely long sushi counter with two carefully organized refrigerator cases well stocked with glistening fresh fish ..... the precise, almost orchestrated movements of cutting and assembling sushi and sashimi make an amazing show "
" Hajime's draw is the fine variety of pristine raw fish kept on hand "